Also known as "Canada en guerre"
"After the outbreak of World War II Canada was transformed into a fighting machine. The production of war materials multiplied; the recruiting and training of fighting men were pushed to the maximum; and twenty-four thousand miles of coast line were guarded. 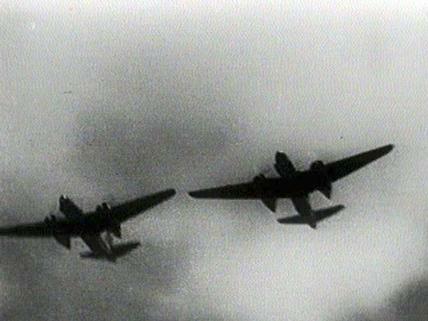 In addition, Canada became the foremost training ground for Allied airmen. In a spirit of democratic cooperation Canadians responded to the needs of war." "The film [Inside Fighting Canada] was making an important point. Audiences had seen in earlier films how the Nazis were building their empire upon a modern form of medieval slavery. Democracy built its defences with the voluntary effort of people exercising their own free will. Here then was the implied comparison between the two systems and democracy stood supreme. Characteristically, no mention was made of conscription, which had split the nation badly in the spring of 1942." "As it stresses the importance of women's contribution during the war, Inside Fighting Canada emphasizes that this effort should not be conceived as a 'temporary war measure,' and that instead, it should be considered the start for a new era where women can equally contribute to building a better future for the entire society." National Film Board of Canada. "NFB -- Inside Fighting Canada." National Film Board of Canada. http://www3.nfb.ca/collection/films/fiche/?id=17062.